Next week I am presenting at a conference with over 250 participants who are keen to foster resilience. A few weeks ago I talked about Jane McGonigal author of SuperBetter (a revolutionary approach to getting stronger, happier, braver and more resilient) and she defines resilience as – ‘your ability to stay motivated, curious and optimistic even in the face of a challenge’. Allowing this definition to set the direction for the session I’ll introduce my resilient audience to a protagonist (role modelling excellence), the plot (resilience exists with a cycle) and a practice (how we can remain resilient every day). 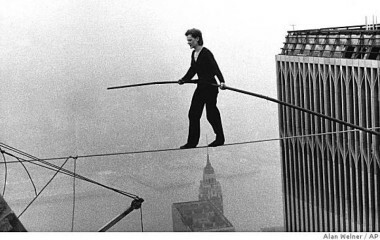 Enter our role model…Philippe Petit, the French high wire walker who shocked the world in 1974 when he walked between the Twin Towers of the World Trade Center in New York City. Petit referred to the illegal rigging of a 200 KG cable as ‘le coup,’ demonstrating that resilience starts long before the performance itself. Which I am sure you are keen to know took place 400 meters above ground and lasted for 45 mins before the cops took hold. 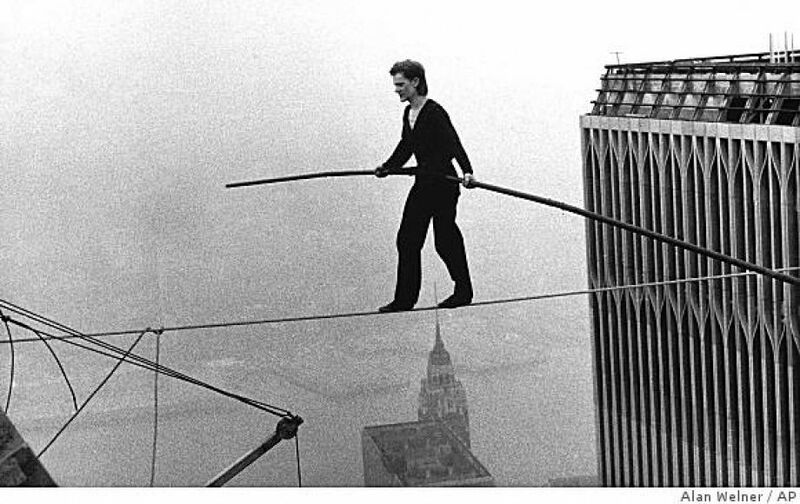 This mind blowing act reminds us (enter the punchline) that resilience is not a balancing act. Instead it is a harmony of energies – purpose, focus, passion, discipline and playfulness to name but a few. Work/life balance no more. The Walk (released in 2015) brought Petit Hollywood fame, and just like any compelling story the plot did thicken. Immense struggle to coordinate such an audacious goal, years of practice and fly in your face planning to access the towers. But unless Petit releases the tension this energy will find its way onto the wire. His pre performance routine a chance to reflect and find clarity. Now the flow state begins, calm, serene, beautiful. At one, peace, meaning and eight more crossings. After flow comes the low; time to recover, recount and congratulate with his team. A perfect illustration of how resilience fits within a framework, one which you can recognise and engineer every day. The practice gives us 5 areas to focus on, the harmony of energies that I have already introduced…spirit (purpose), mind (focus), heart (passion), body (discipline) and soul (playful). Daily intentions that tap into these energy sources. Precise and energy boosting amongst the struggle. Maybe manifesting as…spirit (staying true to yourself by speaking up in a meeting), mind (researching the hell out of something), heart (congratulating a colleague), body (going for a walk at lunch) and soul (chilling out with a good book). Now this might not elevate your attitude or altitude to Petit’s dizzy heights but the protagonist, plot and practice are all within easy reach.